Home » Industrial » Agricultural Covers » What is Anaerobic Digestion? Aneorobic Digestion is the process where the interaction of micro-organisms and biodegradable material generates methane. The process is used to manage waste but increasingly is used to generate fuel. It is used as part of the process to treat biodegradable waste and farm slurry. Anaerobic digestion reduces the emission of landfill gas into the atmosphere. Anaerobic digesters can also be fed with purpose-grown energy crops, such as maize in order to increase gas yield. Anaerobic digestion is increasingly used as a source of renewable energy. The process produces a biogas, consisting principally of methane and carbon dioxide which can be used directly as fuel, in combined heat and power gas engines. 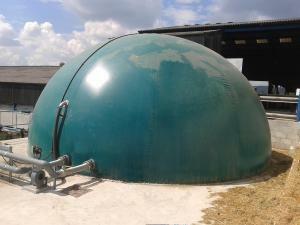 A twin skin biogas storage dome. This twin skin dome has gas coming in from the digester and gas out pipe leading to the power generating gas engine.